• External lighting for exits, parking lots, landscaping, etc. There is a big difference between being able to handle basic home electrical repair and running electrical maintenance for an entire property. You have to be able to handle emergencies quickly, and at any time, day or night. You have to know all about external lighting, and that includes some special equipment requirements that you might not be able to meet. You have to be trained in the latest equipment and techniques, and in the world of electrical service, that can change in an instant. Unless you are a trained electrician with an entire crew and equipment at your disposal, keeping up with a property would be tough to do. • We have experienced technicians to handle every need. • Our stocked service trucks are equipped to handle all service issues on the spot. • Our flat-rate pricing ensures that you know the price before we begin any work. • Our advanced project management software allows you to track our arrival, what we did while we were there, and when your job was completed. Blue Collar Electricians offers 24-hour/7-day-a-week service for properties like yours to ensure that no matter what happens along the way, your tenants don’t have to worry about high-performance electrical service. Don’t try to handle it yourself. 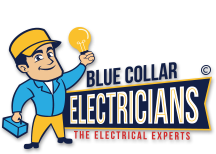 Contact us today and find out why Northeast Ohio trusts Blue Collar Electricians with its properties!